Whether you're apartment hunting or not, sometimes it can be entertaining to step inside a deluxe real estate listing to see what life could be like if money were no object. So what exactly does the top of the line of Chicago's rental market look like today -- and just how fancy do these apartments get, given these astronomical prices? We examined local listings in Chicago via rental website Zumper to determine the city's most extravagant listings. 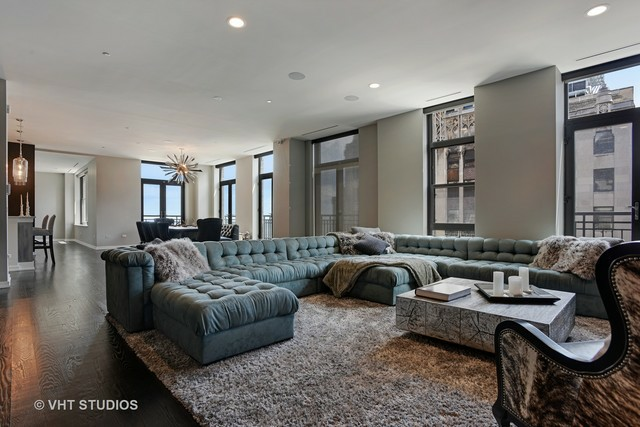 First off, salivate over this condo over at 11 E. Walton St. in Streeterville. It has three bedrooms and three bathrooms, and it's a voluminous 3,436 square feet in size. Whereas the average price for a three-bedroom rental in Chicago is approximately $2,395/month, this place is currently going for a jaw-dropping $23,000/month. What, exactly, makes it so high-priced? In the furnished unit, you can expect hardwood floors, a fireplace, a balcony, marble countertops, wooden cabinetry, a breakfast bar, built-in shelves and floor-to-ceiling windows. A swimming pool is offered as a building amenity. Pets too can reside in this palatial residence. Walk Score indicates that the area around this address is extremely walkable, is very bikeable and is a haven for transit riders. Moving on, here's this condo located at 6 Michigan Ave. in the Loop. It has four bedrooms and four bathrooms, and it's a voluminous 6,400 square feet in size. Whereas the average price for a four-bedroom rental in Chicago is approximately $3,200/month, this pad is currently priced at a mind-boggling $20,000/month. In the sprawling penthouse apartment, you'll find high ceilings, a skylight, private outdoor space, a terrace, two rooftop decks, walk-in closets, stainless steel appliances, wooden cabinetry, recessed lighting and hardwood flooring. The building boasts assigned parking, a party room, a sauna, a door person and secured entry. Pets too can partake in this opulent villa. Walk Score indicates that the area around this address has excellent walkability, is convenient for biking and boasts excellent transit options. Finally, check out this condo located at 50 E. Chestnut St., #3301, in Streeterville. It has three bedrooms and three bathrooms. This spot is currently priced at an inconceivable $17,000/month. Apartment amenities include air conditioning, a mix of hardwood floors and carpeting, a balcony, a ceiling fan, a dishwasher, a fireplace, high ceilings, in-unit laundry, wooden cabinetry, stainless steel appliances, recessed lighting and two terraces. The building has a door person, a private elevator, a fitness center, garage parking, on-site management and extra storage space. Inhabiting this voluminous rental isn't all-inclusive: cats and dogs are not permitted. Walk Score indicates that the surrounding area is a "walker's paradise," is very bikeable and is a haven for transit riders.